The photographing of this dress apparently defeated me. First, she was the biggest pain to fit. I can’t even explain why. Second, her lining is mostly shattered, and about 1/4 of her skirt is detached and unpleated from the bodice. While I can distinctly remember being frustrated with her, I did not realize I only got two basic shots of her at all! 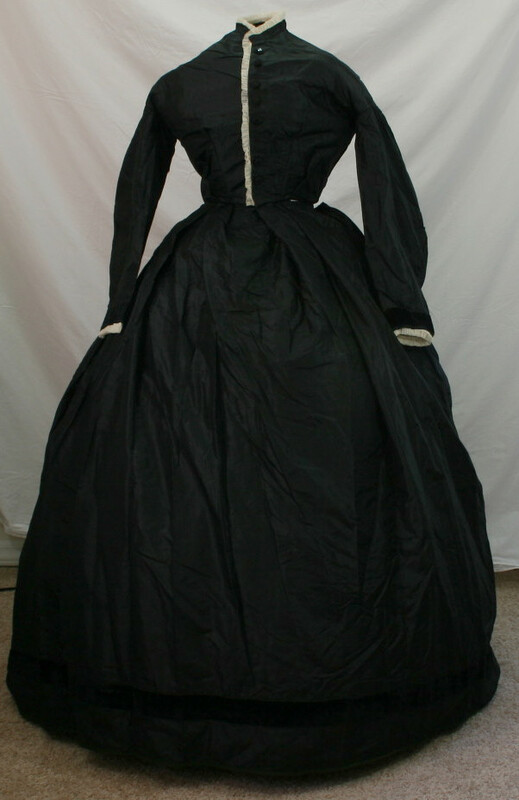 Continuing forward- this dress is fairly standard for the 1860s. 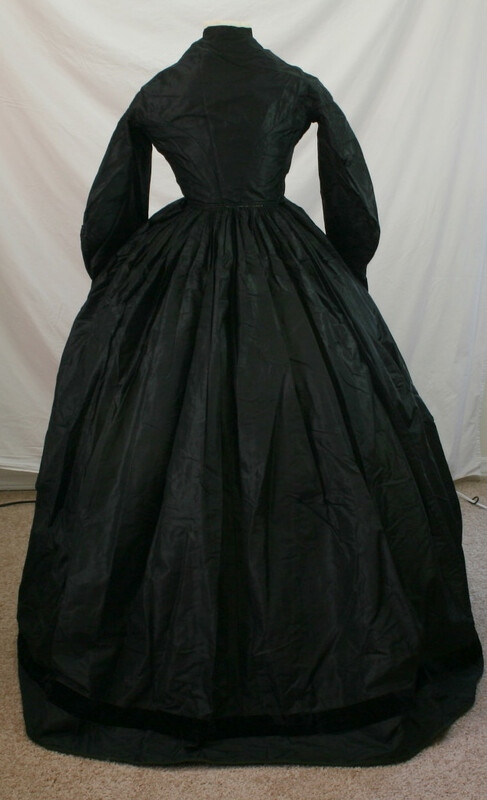 Dart-fitted silk, 3-piece back, coat sleeves. The back of the skirt is cartridge pleated to fit and the front is box pleated. She closes with hooks and eyes and has decorative glass buttons. The skirt and cuffs are trimmed with 1.5″ silk velvet, and the bodice opening and the cuff opening are trimmed with with cotton net. She features a small stand-up collar. The waist is 24.5″. The bodice is lined in plain weave brown cotton, and the sleeves and skirt are fully lined in brown polished cotton. The bottom of the skirt is finished with a facing of a different shade of brown polished cotton and wool hem tape that has been wrapped around the raw edges and stitched. The long seams are sewn on machine, and all else is sewn by hand. The four center-front darts are boned, as well as the eye side of the opening. Yep. Two pictures. Luckily she’s a fairly plain dress with common construction techniques!